Effective CPAP therapy means a better night's sleep! 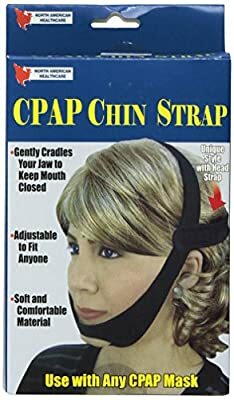 This soft chin strap cradles your jaw to help keep your mouth closed and prevent nasal and oral drying while wearing your CPAP mask. Adjustable and lined for comfort. Back strap for a secure fit. Works with any CPAP mask. Neoprene. Imported. Gentle wash. Max. circumference 32 1/2".